This section provides research topics, research projects in which I have been involved, a publications list, and further activities. My current research interest is foremost the Semantic Web, a growing research area in the middle between database, artificial intelligence, and Web technologies research. The goal of the Semantic Web is to enable enhanced applications by simplifying or enabling interoperability on the Web. The technology, which I helped to create, is now increasingly adopted by industry. E.g., Oracle just announced that its database will support RDF in the next release. Semantic Web 2.0: The Web 2.0 concept summarizes recent technical developments in the Web domain. The developments create the structural metadata that can the Semantic Web standards can can support. Grid computing needs support for automating tasks that right now requires human communication and intervention. Semantic Web technology provides important contributions here. At ISI I started a collaboration with the Center for Grid technologies (headed by Carl Kesselman) and applied Semantic Web technology to resource matching on the Grid. At DERI I continued that effort within the Adaptive Services Grid. Digital Libraries are one of the original inspirations for the Semantic Web, coming from Dublin Core metadata. At DERI I initiated a Semantic Digital Library project with focus on semantic search and metadata generation and indexing. The result is an Open Source Digital Library, which we are distributing across Europe. Community Portal Infrastructure benefits from Semantic Web technology in the form of Semantic Social Networking. The Social Semantic Desktop, my most recent research activity, is the application of Semantic Web technology for the desktop. 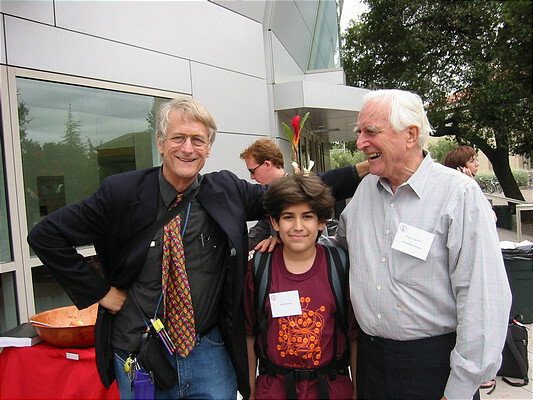 This activity was influenced by several meetings with Doug Engelbart in Stanford and the realization, that the technologies and communities to create and evolve a collaboration and information management environment like NLS came into existence only recently. The integration of technology and scientific areas was and is in the focus of my activities, and includes areas such as AI, web services, peer-to-peer technology, ontology integration and articulation, and interoperation. Applications of these technologies can be found in areas such as knowledge management and electronic commerce. Digital Enterprise Research Institute, Galway, Ireland. Since October 2003: Ontology Infrastructure, Semantics in Collaboration and social networking, Automated Information Extraction and Annotation, Semantics for Digital Libraries, Community Protal Infrastructure. Institute for Knowledge Based System, IBM Germany, Heidelberg, 1991-1992: Knowledge Modelling, Inferences, Knowledge based security management in enterprises. DERI LION (2003-2008). Grant for establishing a research center at the National University of Ireland, in Galway dedicated to Semantic Web Research. (5 year grant, 12 Mio. Euro). Project of the Defense Advanced Research Project Agence (DARPA), Program DARPA Agent Markup Language (DAML): OntoAgents: An Information Foodchain for advanced applications on the internet. Stanford University. A subcontract was given to the Institute AIFB, University of Karlsruhe, Germany (2000-2004) (Funding: 1.2 Mio US$. I wrote the proposal and was nominated as the key person of the proposal). Consulting for Ontologent, Sunnyvale, California, on the use of ontologies and Semantic Web technology for service provisioning in wide area networks (2000-2002). The project resulted in several patent applications, covering service composition. Project in the Information Society Technologies (IST) Programme for Research, Technology Development & Demonstration under the 4th and 5th Framework Programme: IBROW: An Intelligent Brokering Service for Knowledge-Component Reuse on the World-Wide Web. Project partners are the University of Amsterdam (coordinator); the Open University, Milton Keynes, England; the Spanisch Council of Scientific Research (IIIA) in Barcelona, the Institute AIFB, University of Karlsruhe, Stanford University, iSOCO, Intelligent Software Components S. A., and the Vrije Universiteit Amterdam (1998-2002). IST-1999-19005, open domain. Co-founder of Ontoprise GmbH, Germany. Ontoprise is a company devoted to provide semantic technologies and applications (Member of the Team from June 1999-July 2001). I left the company because of the move to Stanford and new consulting activities in the Silicon Valley. Project with DaimlerChrysler for developing an intranet solution for Knowledge Management (1999). Project with BASF, Ludwigshafen for developing an intranet infrastructure for benchmarking business processes and Knowledge Management (1999). The Knowledge Annotation Initiative of the Knowledge Acquisition Community (KA)2 is an initiative officially launched at EKAW-97 to develop an ontology that models the knowledge acquisition community (its researchers, topics, products, etc.). This ontology formed the basis for annotating WWW documents of the knowledge acquisition community in order to enable intelligent access to these documents (1997-1999).